School buses and tank trucks carrying flammable liquids must stop at all railroad crossings. Be prepared to stop at railroad crossings when following one of these vehicles. Drivers may park in the handicap parking access aisles located directly beside handicap parking stalls. It is prohibited for anyone to park in handicap parking access aisles. These aisles are meant to provide space for wheelchairs and wheelchair lifts. 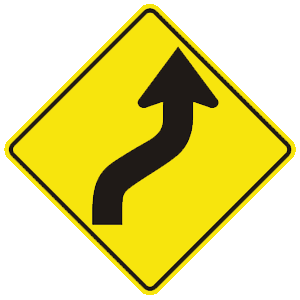 Be prepared for a person or vehicle to unexpectedly enter your lane. Expect all other drivers and pedestrians to respect your right-of-way. Drive closely to the parked vehicles to allow more room for moving traffic. Keep a space between your vehicle and parked vehicles. A person may step out of a parked vehicle or out from between the parked vehicles without looking. A driver may begin moving their vehicle before realizing you are there. The posted maximum speed limit is the fastest you can drive in an area. The posted maximum speed limit is the fastest legal driving speed in an area, under ideal conditions. You must reduce your speed when conditions require it, such as when the roadway is slippery or when it is difficult to see clearly down the road. 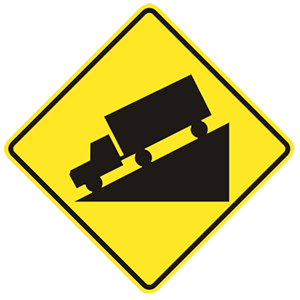 This sign indicates that a steep downhill grade is ahead.